Crossrail's first 'living walls' - Crossrail . For information about the Elizabeth line please visit the Transport for London website. 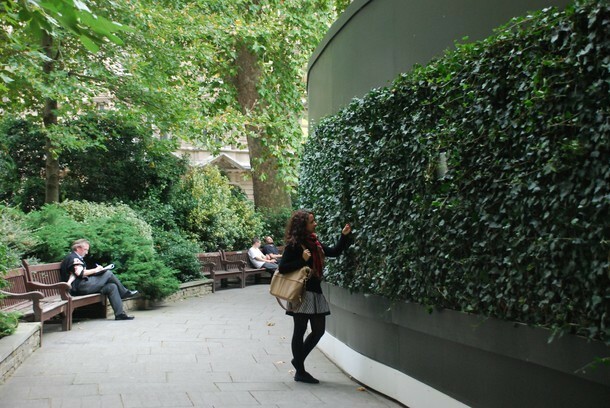 Crossrail’s first ‘living walls’ have been installed around our worksite in Finsbury Circus Gardens. These vertical gardens will help improve air quality by reducing dust, pollen and carbon dioxide levels. They will also improve the look of our worksite and benefit biodiversity by providing new wildlife habitats. The living walls act like a breathing, photosynthesizing skin and consist of plants that thrive in the urban environment. The walls also help to purify the air and transform the worksite boundary.The gardens mimic the action that plants use to grow vertically on cliffs, branches or along waterfalls. The walls are maintained through a build-in irrigation system that uses soil-free technology to receive water and nutrients from vertical supports rather than the ground. Living walls will contribute towards The Mayor of London’s plan to reduce PM10 airbourne particle pollution by a third by 2015. Living walls will be grown around other Crossrail sites soon. If you would like to sponsor a living wall please contact art@crossrail.co.uk.